All transactions are safe and secure with a reliable history in online purchasing behind each of our associates. 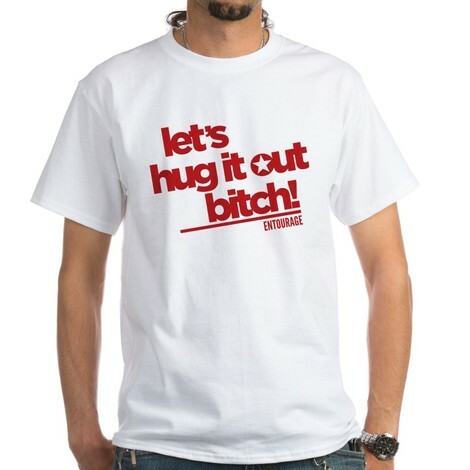 Buy the Entourage Let's Hug It Out t-shirt to own Entourage clothing and merchandise. This design reminds us that the best way to solve an argument is to hug it out. Wear it to the premiere of Medellin, the fictional bio pic about Pablo Escobar, a ruthless Columbian drug dealer who, in 1989, was ranked as the seventh richest man in the world by Forbes magazine. Vincent Chase stars in the movie as Escobar and Billy Walsh directs. Pair it with a Medellin Entourage t-shirt to celebrate the Pablo Escobar film. The title Medellin refers to the city in Columbia where Escobar was shot dead. In addition to the Entourage Let's Hug It Out tee above, browse the Entourage Clothing Gallery for more apparel like men's and women's clothes, kids shirts or hoodies.